At the Scene of the Crime: "Name is a fence and within it you are nameless." "Name is a fence and within it you are nameless." I’ve just noticed a pattern between today’s review and my last one, The Devotion of Suspect X. Both books were published just this year, in 2011— and today’s book, Bill Pronzini’s Camouflage, was published just earlier this month! So this really is the newest book I’ve ever reviewed! 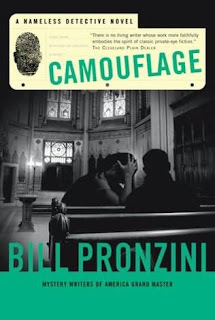 I have quickly become highly enthusiastic over the work of Bill Pronzini, particularly his Nameless Detective series. Since reading Hoodwink, I’ve gone on to read several books by Pronzini— I consider him one of the finest talents in the mystery field today. Nameless decides to accept the job, and as it turns out, Tamara doesn’t have much trouble locating Virden’s first wife, Roxanne McManus. Nameless shows up, explains what he wants, only to have the woman toss him out. He reports to Virden, who decides to have a one-on-one chat with his ex… but a while later, Virden telephones back, furious: the woman in question is not his ex-wife at all, he claims, and he threatens to stop payment on his cheques and a potential lawsuit. But just as suddenly, Virden disappears, and his fiancée hires Nameless to track him down. Thus begins a series of events that puts Nameless on the track of what I can only describe as Pure Evil. In the second storyline, we see a lot more of Jake Runyon (one of the agency’s operatives) and Bryn Darby, a woman whose left side of her face is paralyzed. Bryn’s young son, Bobby, lives with his father, and Bryn suspects the man has been abusing the child. Bobby is uncommunicative, has a fractured arm and several bruises, and he refuses to talk much about them. 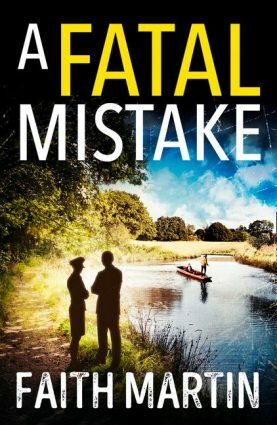 Jake manages to get through to him and finds out that not all is what it seems, and someone else may be behind the boy’s injuries. In due course, the situation explodes into murder, and rather surprisingly, this is a genuinely solvable mystery somewhat in the traditional vein. I solved it, but I have to give Pronzini credit: he didn’t go for the “easy” or “tragic” solution that a poor crime show like CSI would. He shows far more ingenuity, and I solved it more or less through a hunch. A good, subtle clue is given, but the major and conclusive clue is given a few pages before the culprit is revealed. The solution is genuinely tragic (but I refuse to say more or I’ll find myself giving the game away). Pronzini writes with such deft skill that issues such as “Is this fair clueing?” are rendered immaterial. Again, he outdoes his contemporaries by achieving a wonderful balance between characterization and plotting— and with the second plot strand, characterization and plotting go hand-in-hand on more than one occasion, which ensures that there will never be a dull moment for the reader. I was surprised at a few things in this novel. First and foremost, I found myself liking Tamara. I was rather harsh about her character when I wrote about Schemers, but I admitted it was only a one-book sample. The events of Schemers and the book that followed, Betrayers (which is on my reading pile), seem to have subdued her a little. She isn’t nearly as brash and outspoken and she has gained a little bit of wisdom the hard way. Her character is far more sympathetic and interesting here. Jake Runyon, like in Schemers, is wonderful. His relationship with Bryn is genuinely touching, and they will tread dangerous waters together by the story’s end. The child abuse angle is handled well— Pronzini doesn’t get disturbingly detailed about the abuse, nor do we get psychotic interior monologues from the abuser or their victim. Pronzini alternates between various viewpoints again—this time, Bryn Darby is one of the characters we follow—but once more, first person narration is reserved only for Nameless. Overall, Camouflage is an excellent and welcome addition to the Nameless Detective series. Once again, hats off to Bill Pronzini for the fantastic work! I wonder how long we can keep this streak going until we hit upon a Nameless novel that we don't like. He wrote so many of them that it's inevitable. But I'm expecting two of his books to arrive this week, which promises to be absolutely fantastic, so the good ones will hopefully be pouring in for the time being.